Today we are interviewing Eric Vanderburg, author of the non-fiction computer book CompTIA Storage+ Quick Review Guide. 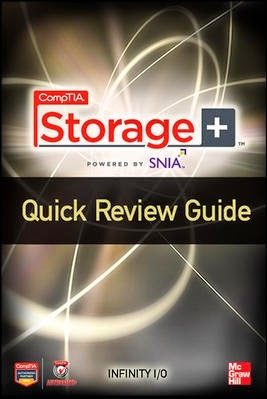 This book is primarily a guide for those wishing to take the CompTIA Storage+ exam. It provides a comprehensive and vendor neutral description of storage concepts beginning with how a hard drive works to how data is stored in the cloud. It is a valuable resource for both those taking the exam and those wishing to know more about this complex yet interesting subject. This book is geared towards those with knowledge and experience in information technology who wish to learn more about storage networking. Many organizations struggle to manage the overwhelming amount of data they store today. Almost our entire lives is becoming digitized including emails, instant messages, locations, tweets, blogs, voice mails, contact lists, call lists, drafts and memos. All this data must be stored somewhere. With storage comes the need to search and retrieve the information quickly and this book helps those tasked with managing storage figure out how to get a handle on it all. Of course, this book never would have been if it hadn’t been for the encouragement of my wife and the guidance of my editors. When writing a technical book such as this, I often found myself asking the “why” question. There are some things that you take for granted with working with data that must be described in a book. For example, when writing about solid state storage, I asked the question of why one form of solid state would last longer than another which led me to research more and more on how solid state technology works. This book will equip readers to pass the exam and it will give them an understanding of storage that is crucial to managing it within their organization. Some will be able to land new jobs with the skills this book contains and others will be able to be more effective in the job they currently have. Imagine a world where artists are heroes and graffiti is punishable by death. Imagine a sect that seeks to control a kingdom by unlocking hidden catastrophic powers. This is a story of creativity, charisma, and courage -- of schemes, plots, and magical art. A book exists containing secrets of great power. Used once by a king in the hope of saving his kingdom, it doomed him instead. Centuries later, history’s terrible atrocities are mostly forgotten and mankind will have to learn again the consequences of absolute power. In a clash of kingdoms and plots from a mysterious sect, a mason, merchant, and two artists are given the chance to prevent disaster. Can steel, charisma, and magical art stand up to overwhelming odds? The book is a great resource. It starts with the concepts of storage and then builds on those to show how those concepts work to provide common solutions to real organizational storage problems. I struggled with the same challenges this book covers years ago and I wished that there was a book like this to help me through it. I guess I had to learn it the hard way. That worked out well for me because I learned a lot more along the way but it is much easier to have a resource like this.